The process of pipe installation requires precision and skill and must be undertaken by professionals experienced in the engineering and construction of the process. Abergeldie are able to offer an effective solution of laying underground pipes without the need to dig a trench. Our team can efficiently construct horizontal pipe jack tunnels which can provide conduits for underground services. Having successfully adapted modern Tunnel Boring Machine (TBM) technology to complex ground conditions, we are able to effortlessly jack pipes to 3.0m external diameter in hard rock or soft material. Abergeldie’s tunnelling engineers are extremely experienced in trenchless tunnel construction. Typical examples of Abergeldie’s pipe jacking projects is an 87m long pipe jack tunnel for Ausgrid in Burrows Road Alexandria, Sydney. 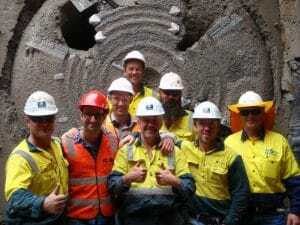 The 2800mm diameter tunnel carries 6 x132kV cable circuits which form a part of the reconfigured Energy Australia Network from TransGrid’s Beaconsfield South substation. 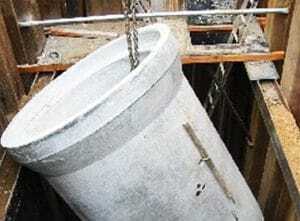 An Earth Pressure Balance Machine (EPBM) was used to overcome the difficult water-charged ground conditions. A 120m long and 2400mm diameter tunnel through sandstone in Carlton. All of these projects included construction of permanent access structures that were used initially as send and receive pits. 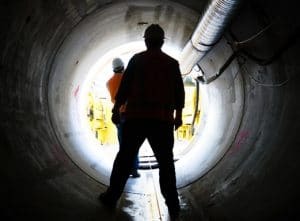 The projects also included fit-out of the tunnels with the necessary cable support brackets so that the cables could be installed later by others. Further information on some of Abergeldie’s pipe jacking projects can be found below.